What are the arguments for ignoring climate change? The simplest is to deny such a thing exists. President Trump’s tweets on the topic, for instance, mostly run along the lines of “It’s record cold all over the country and world – where the hell is global warming, we need some fast!” But this is plainly at odds with the evidence, given what we know now about rising temperatures and accumulation of heat in the oceans. The next-level argument accepts that the world is warming, but claims that humans are not responsible. However the recent climate record is difficult to explain any other way. For example, while the lower levels of the Earth’s atmosphere are warming, the stratosphere is cooling. This is contrary to what would be expected if warming was caused by increased solar activity, or changes in the Earth’s spin and tilt that expose the planet to more incoming radiation, which would heat the atmosphere all the way through. But it fits if the predominant cause is a thickening blanket of heat-trapping greenhouse gases close to the surface of the planet. One might argue that climate change is underway, and yes, humans are responsible by and large, but it is not such a bad thing. Under this banner a variety of positions are taken. It may be (and is, sometimes) claimed that the benefits of climate change outweigh the disadvantages. More common is a nuanced argument along the lines of “it is not such a bad thing compared with other problems we now face” and therefore it makes sense to push climate change down the list of priorities. In effect, the problem is ignored. The “not such a bad thing” world-view minimizes the risks of climate change to human health and well-being. One way of testing this position is to examine the impacts of past changes in the climate (which, it must be noted, are relatively minor compared with what is projected to lie ahead if present trends in greenhouse emissions continue). Climate change has played an important part in the long course of human history. Indeed the emergence and success of our species were climate-related. Environmental conditions were the motor that drove evolution – stature, mobility, skin colouring, brain size are just some of the consequences of intermittent drying, heating, and cooling, and it is not drawing too long a bow, perhaps, to say that in some respects climate change made us human. Bearing in mind this legacy, it is not so surprising that our physiology is very sensitive to ambient temperature and humidity. Humans operate, as tuned machines, in the “Goldilocks zone”, with just enough but not too much warmth or rainfall. Pre-requisites for health such as a nutritious diet and a secure supply of safe drinking water are affected by climate; disease vectors (mosquitoes and ticks for example) may be suppressed or promoted by climate shifts. 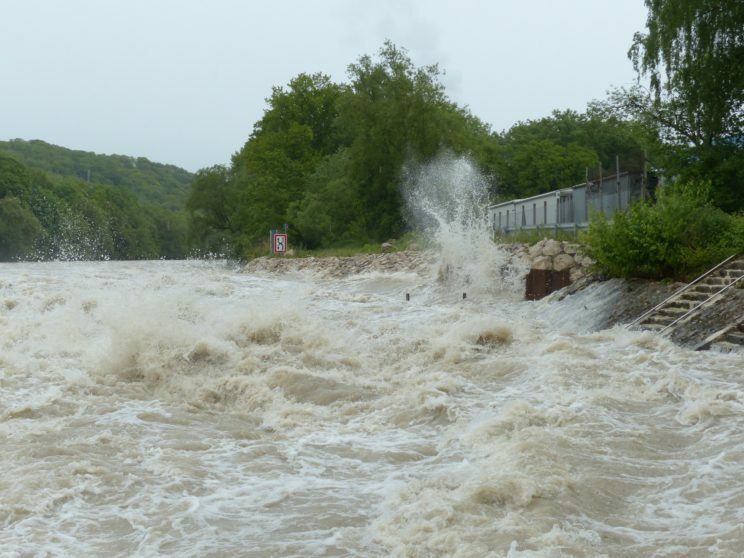 Extreme weather leading to floods, fires, and heatwaves causes death, disease, and displacement, even in high-income countries – and the effects are amplified by poverty. High water by Hans. CC0 Public Domain via Pixabay. If we want to understand the sensitivity of human societies to heating, cooling, drought, and excessive rainfall, then there is ample material in the historical record. Crises stand tallest – there are many examples of dramatic peaks in mortality associated with droughts, migration, warfare, and plagues. Rapid cooling and unusual variability in the climate at the end of the so-called “Classical Optimum” (around 400 CE) promoted the arrival and spread of new infections in failing Rome. Hunger and violent disorder following crop failures in drought-ridden Central America accelerated the fall of the Mayans. When Mt Tambora erupted in 1815, it threw so much ash into the atmosphere that temperatures fell around the world by as much as three degrees Centigrade on average, leading to a decade of food crises, epidemics, and social unrest. 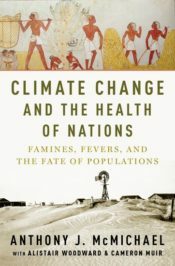 The spread of farming, the Bronze Age, the rise and fall of American civilizations, and the impacts of the Little Ice Age in Europe and China all present direct connections between death, disease, de-population, and climate changes in both the regional and global sense. So the argument here is: if we look back, we see the ways in which climate bears down on human health. If we look forward, we face changes that greatly exceed, in scale and speed, what happened in the past. The Holocene, the past 11,000 years during which human culture flourished and the nation state emerged, was a relatively stable time. Rises and falls in decadal-average temperatures rarely exceeded two degrees Centigrade. The Intergovernmental Panel on Climate Change (IPCC) projected that global average temperatures may rise by four degrees Centigrade by 2100, with heating occurring much more rapidly in some parts of the world (most spectacularly and dangerously, in the Arctic). In short, we ignore climate change at our peril. What puts humans at risk is the combination of culpability (we have the capacity now to put a serious spoke in the wheel of global systems) and vulnerability. To those who cannot or will not engage, we might say “watch out – humans may be clever enough to cause the problem, but not clever enough to escape the consequences, short of mass migration to a new and better planet”. Featured image: Tree by katja. CC0 Public domain via Pixabay. Alistair Woodward is a Professor of Epidemiology and Biostatistics at the University of Auckland. He has worked extensively on environmental health issues in New Zealand and many other countries. He has investigated climate change, road safety, housing policy, the risks of cell phones and other modern concerns. Closely involved with the work of the Intergovernmental Panel on Climate Change since 2001 (and a co-recipient of the Nobel Peace Prize in 2007), he led the writing group on health impacts for the 5th Assessment Report. He has worked frequently for WHO as a consultant on environmental health topics; most recently on the health co-benefits of well-chosen climate mitigation measures. Thank you for this. Do it again, more graphically. Sorry, but I want a way to shake fossil fuel corp heads! How about blame? Can’t you picture society dciding that they are guilty of genocide, not of one nationality but of our species, so specicide I’m not being funny! What no one talks about is it’s the human population that drives the increase in the greenhouse gases. In the end the population will be reduced by shorter life span do to the effects of the greenhouse gases. When it reaches a sustainable level the problem will be solved. Sorry, that is the sad fact.